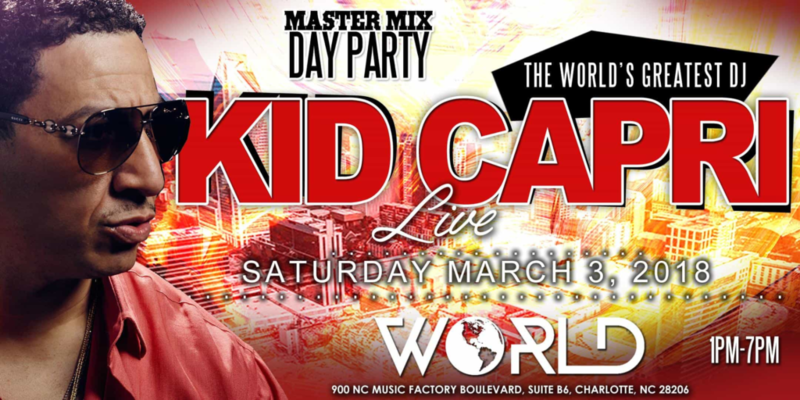 The world’s greatest DJ Kid Capri is coming back to CIAA weekend for the Master Mix Day Party this year to blow the roof off World Nightclub (formerly Label Nightclub) again! This is the hottest day parties of the CIAA weekend and one you definitely don’t want to miss. Since taking over the space formerly owned by Label Nightclub last year, World has become the go-to spot for Charlotte nightlife. With unbeatable service, state-of-the-art sound and the best VIP sections in the city, this is the best location for a CIAA weekend day party! Doors open at 1PM, and the party features some of the HOTTEST movers and shakers and mixed beats flowing all day long! Book your exclusive VIP table with bottle service now, as these tables go fast. You can book regular event tickets or a VIP section at www.charlotteparties.com. Get more info about bottle service and the VIP section by 980.226.8214 or emailing vip@charlotteparties.com.